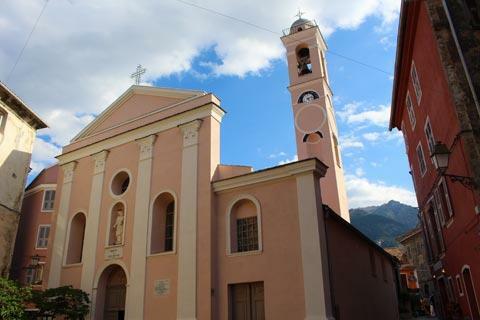 Corte is a town in the mountainous heart of Corsica, approximately 70 kilometres south-west of Bastia and 80 kilometres north-east of Ajaccio: the main road across the island is between Bastia and Ajaccio and passes through Corte, so the town is less than 1 1/2 hours from either of them. 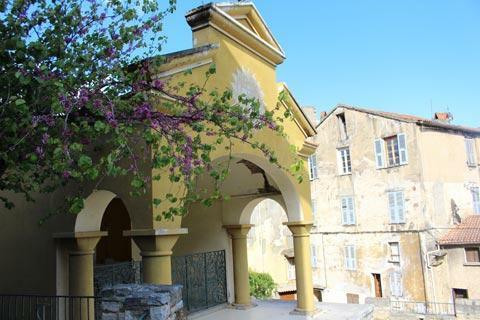 Both Corte itself and the surrounding countryside are very popular with visitors. 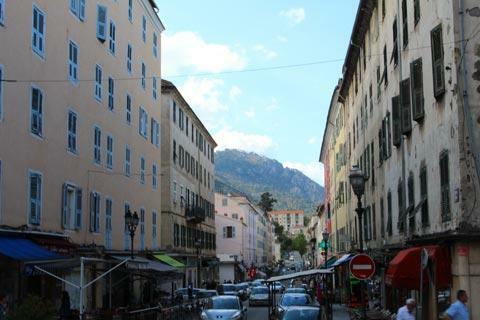 Although Corte is the only substantial town in Corsica to be a long way from a beach I think you will find the mountainous countryside to be adequate compensation, and there are rivers where you can swim in the nearby mountains! 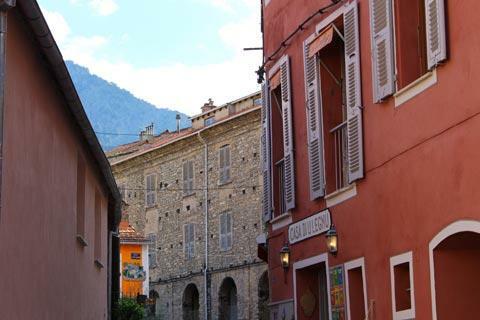 Although Corte is quite a large town, most of it is recent development such as apartments and university buildings which is of little interest to visitors: the main historical centre is really quite small, little more than the size of a village, and does not take very long to explore. The most dominant monument in Corte is the citadel, built in 1419 and perched improbably on top of a large rocky promontory in the centre of the town above the confluence of the Restonica, Orta and Tavignana rivers. 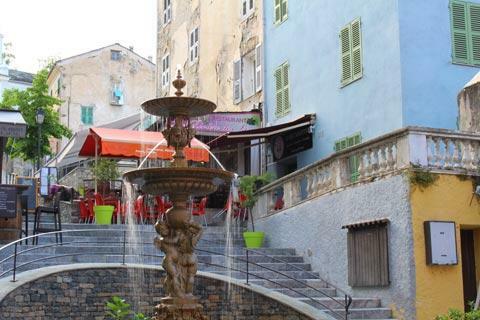 This is a good place to start your visit, and is easily reached by following the narrow streets up the hill through the centre of the upper town. 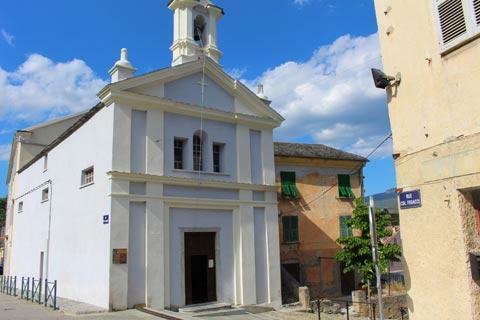 The Museum of Corsica in Corte is in the citadel and explains the history of Corsica, and there is also a Museum of Art and History, with a collection of Italian paintings given to the town by Cardinal Fesch. Note: The best place to see the citadel is from the belvedere just south of the citadel itself. From the belvedere you also have extensive views across the river valleys and mountains as well as the rooftops of Corte. Just below the belvedere around Place Gaffory you can see several of the most interesting buildings in Corte including the Church of the Annunciation and the oratory that date from the 15th century (although the chuch has been substantially altered since), and a house where Charles Bonaparte, a fighter in the Corsica independence movement, once lived. 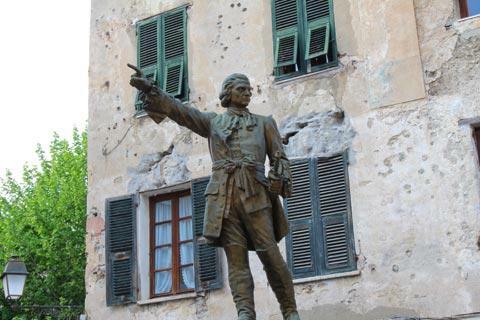 Opposite the church is a statue of Jean-Pierre Gaffory, a leader of the resistance movement in Corsica before Pascal Paoli, and behind the statue is the Maison Gaffory. 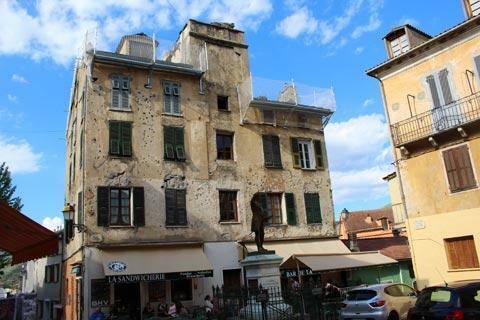 It is said that the many holes in the facade of the Maison Gaffory are bullet holes remaining from an early battle for independence against the Genoese. 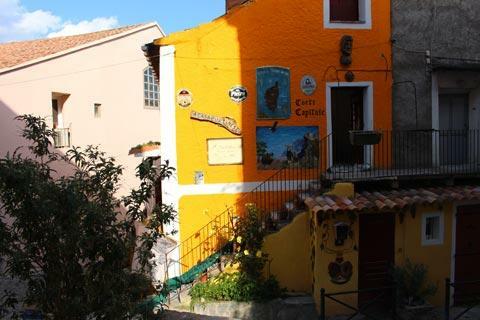 You will also see a small and brightly painted shop just outside Place Gaffory that claims to be the oldest food shop in Europe, having been in business since 1800! 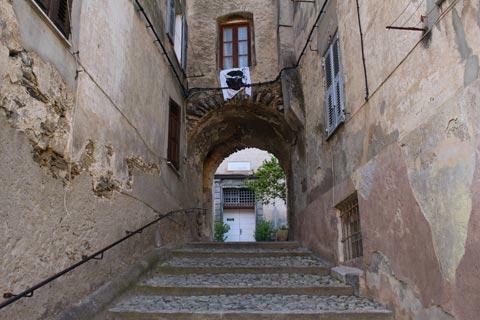 From here, rather than walking straight down into the town centre we suggest you walk along the Rue du Colonel Feracci until you reach the small Chapel Sainte-Croix. 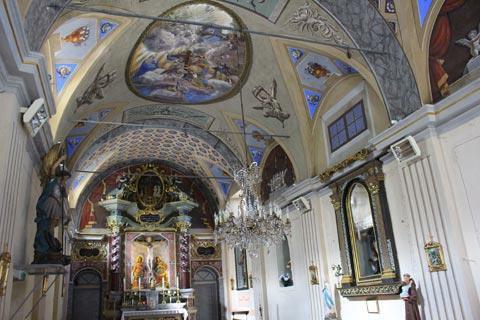 The chapel is very unassuming from the outside but has a nicely decorated interior including some 17th century paintings also presented to the town by Cardinal Fesch, although it is the painted ceiling and wall behind the altar that will attract your attention. 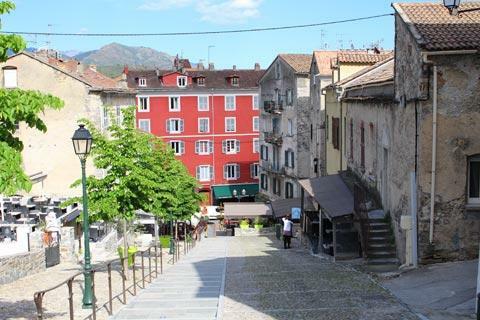 From here you can walk down the steep street that leads to Cours Paoli and on to Place Paoli, the main street and square in the centre of Corte and where you will find most of the restaurants and shops in the town centre. 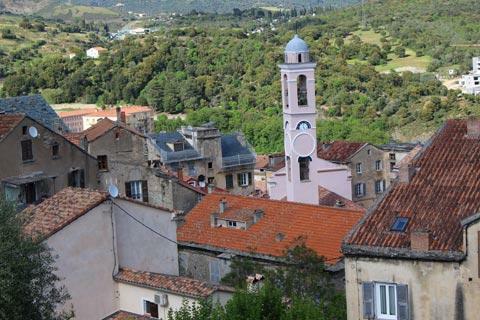 The University of Corsica is also based at Corte, which has 2,500 students in a total population of less than 7,000 and helps ensure the town is lively for most of the year. 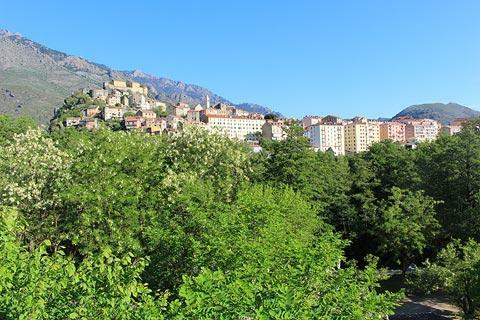 During your visit to Corte, do make sure you get out into the magnificent surrounding countryside: there are numerous trails and scenic opportunities close to hand to enable you to explore the beautiful mountain countryside. 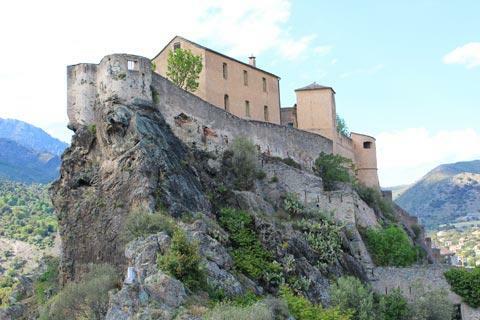 The Office of the Regional Natural Park of Corsica in the citadel building has information about all levels of hiking in the region. Our favourite road to reach Corte from the coast is the D84 from Porto that follows the Gorges de la Spelunca and crosses the Col de Vergio to reach Castirla a few kilometres north of Corte and passes through a very wide range of scenery: not to mention the cows, semi-wild pigs and goats that seem to enjoy sleeping in the road!